I’m a 30-something car owner living in a rented Mt. Pleasant basement apartment. Despite the fact that I am ‘only’ a renter, I’m a midwesterner who considers neighborliness a duty and a joy so I have gone out of my way to introduce myself to my neighbors, to get to know them, and to live fully and civilly on my block. I’m the guy that tries to shovel my neighbors’ sidewalk when I can, I pick up litter, I put a little sweat into beautifying a neglected front yard for my neighbors to enjoy, and I try to keep a watchful eye on the neighborhood. I’m the neighbor who says hello. I’m the neighbor in the building who will bring your packages indoors to keep them safe. I’m the neighbor who will run for blocks after a truck that sideswiped your parked car, get the plate #, and leave you a note. In short, like a lot of your readers, I’m the neighbor that cares not just about the value of comprables but about the well being of my neighbors. I also own a car that has a factory-installed, non-overly-sensitive, anti-theft alarm. As a renter without off-street parking, I must park it on the street. When I hear car alarms go off I rush to the street to make sure that my car is not the offender. It has not had problems in the past. After a restful night, four basement brick walls removed from the noises of Lamont Street NW, I found the following under the windshield wiper of my car in front of my apartment in the heart of Mt. Pleasant [photo above]. At first, like anyone who has suddenly been made aware of car trouble, I was met by a terrible sinking feeling. The kind of feeling that only inconvenience and repair bills can wreak. 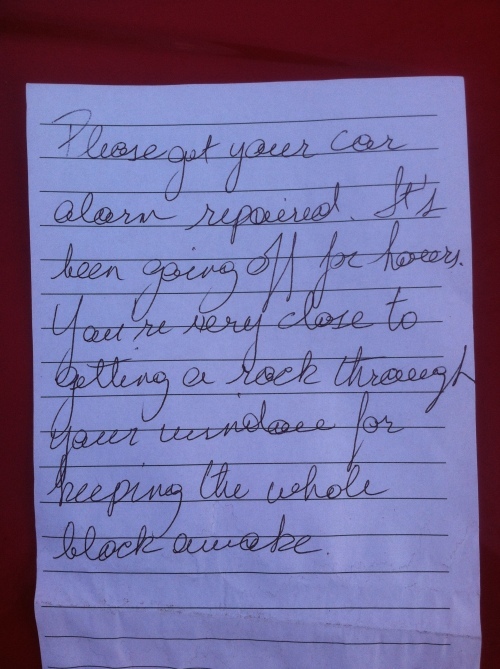 I was then also crestfallen by the idea that the car trouble I was unaware of might have kept my neighbors up. But when I got to the final sentence all of those emotions were slain by a knife to the heart. An anonymous threat from one of the very people that I care about? How hurtful, how dreadful, how eyeopening. Consider the fact that you do not fully know the person to whom you are writing, consider in fact that this may be because you, and not they, have been bereft in your neighborliness. Consider for a moment that the world does not revolve around only you and try to muster a healthy dose of introspection and objective critical thinking. Consider for a moment, that if you took the time to get to know your neighbors, you would be able to alert the subject of your note to their problems and your concerns in person and in a much more constructive manner. In cases of car alarm malfunctions also consider that your note might be the first notice of the need for potentially costly repairs.